The WolfPack women’s volleyball team has been without a win for the past two seasons, but things are starting to look a bit brighter for the team, with a new coach, a new atmosphere and more confidence. The women will have six exhi­bition wins under their belt going into the new season, which begins Oct. 10. One of the exhibition wins was against the UBCO Heat, which made the Canada West final four last year. “It was nice to get a nice per­formance against a strong team in our league. It always helps the girls as far as confidence and believing that we’re doing the right thing,” head coach Chad Grimm said. This is Grimm’s first year as head coach of the women’s team and his first year as a CIS head coach. “When Ken asked if I wanted to take over for the women, it was a great opportunity that I basical­ly just couldn’t say no to,” Grimm said. Grimm has chalked up the exhi­bition wins to new team members and a more positive atmosphere. “I think sometimes change is a good thing. I think a little bit of freedom, a little bit of ability for them to make some of their own choices and some of their own athletic decisions on the court will help them to relax a little bit and maybe play a little bit looser and in turn maybe a little bit better,” Grimm said. 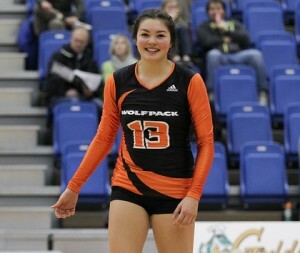 Katie Woo is in her third year with the ‘Pack as a setter. Grimm has a master’s degree in counseling and a bachelor’s degree in human kinetics and education, all of which add to his coaching strategy. “I was aware of, not only the physical aspects, but kind of the change in culture and mentality that would need to occur in order for the program to move forward,” Grimm said. “I think bringing a little bit of a different style, being a little more positive, and challenging the girls to push each other and give them more ownership over the program helps them buy in a little bit more,” Grimm said. The team has eight new players, one whom has returned after a two year absence. “We’re not looking at outcome in numbers so much as asking our­selves: are we doing what we need to do every day to get better, and if we do that, I think at some point the results will take care of themselves,” Grimm said. 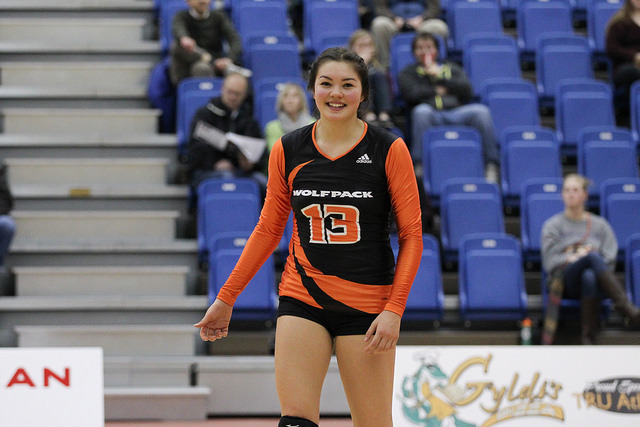 The WolfPack will play their sea­son opener in Langley on Oct. 10 against the Trinity Western Uni­versity Spartans, with their home opener at the Tournament Capital Centre on Oct. 24 against the UBC Thunderbirds.